Granada, Nicaragua. And yes – those are storm clouds in the background! And yes – as a result, we were drenched. Adrian was feeling a bit better in the morning – so although the lovely Reyna (Salvador’s mum) insisted we stay if he was still sick, we decided to pack up and head for San Juan del Sur. 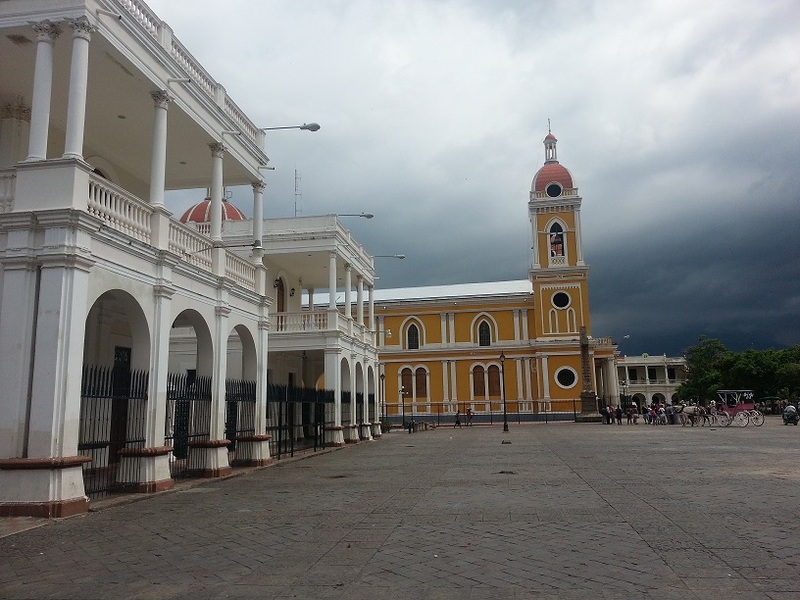 It was a pretty easy drive (by Central American standards) and included a nice little stop in Granada – a Spanish colonial town. 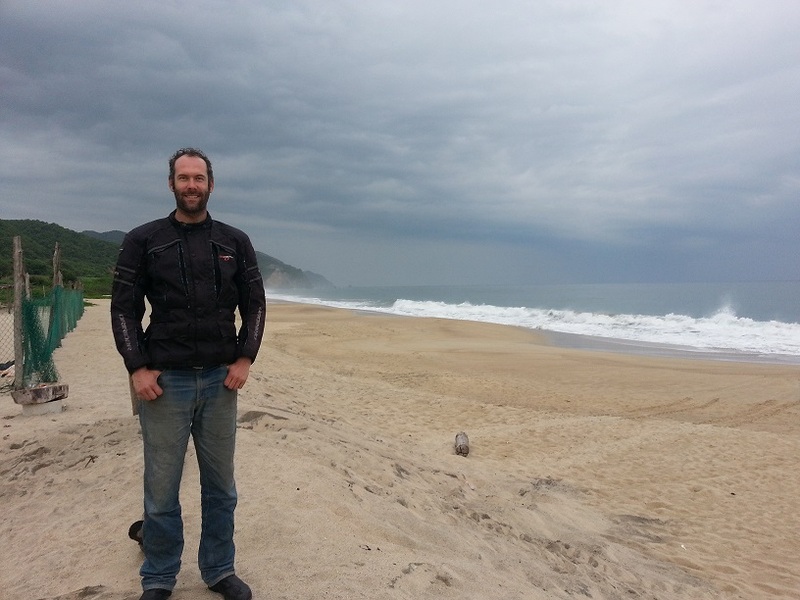 We made it to San Juan del Sur by mid-afternoon… which was perfect timing for a walk on the beach! We stayed in a lovely little cabana on a hill just above the town with an amazing view out to sea… very nice. San Juan has a smallish and well-kept town centre and seems to be a bit of a ‘gringos in residence’ town as well as a tourist destination. It’s apparently just around the corner from the beach used in ‘Survivor Nicaragua’. The key feature of the town is really the beach – and it was lovely. It’s renowned for spectacular sunsets right over the water. We didn’t really experience that as there were too many clouds (have I mentioned that we’re travelling in the monsoon season?! )… however from the dusty pink, the purple and the orange hues I could just make out as the sun set, I’m sure at other times of the year it truly is amazing. After a very light snack (for Adrian) and a normal dinner (for me), we called it a day… although significantly improved, Adrian was still on the flaky side and in need of an early night. Before arriving in Mexico, I’d read in books and other blogs that the roads here are terrible and the speed bump (topes), fierce. At the time, I recall thinking ‘yeah, ok – how bad can they really be?’ I now understand. To be fair, Mexico also has some (well, at least one) of the most impressive roads – and I’ve already blogged about that engineering feat here. In general though, the roads are narrow and often pot holed and/or in the process of being dug up (presumably in order to be resealed – although we’ve not yet travelled on many recently resealed roads…). Detours aren’t necessarily sign posted – for example just yesterday the main highway we were on ended abruptly in a half-built bridge across a river. The was no sign indicating that the road was closed, and we had to ask one of the guys working there to find out that we had to go around by turning off the highway 400m back. And there are sharp, angry little speed bumps everywhere. Most of the time they’re also not signposted, or painted on the road or accompanied by any markings whatsoever that might help an unsuspecting motorcyclist, say with a pillion passenger, see the bump until he is right on top of it. On a highway! 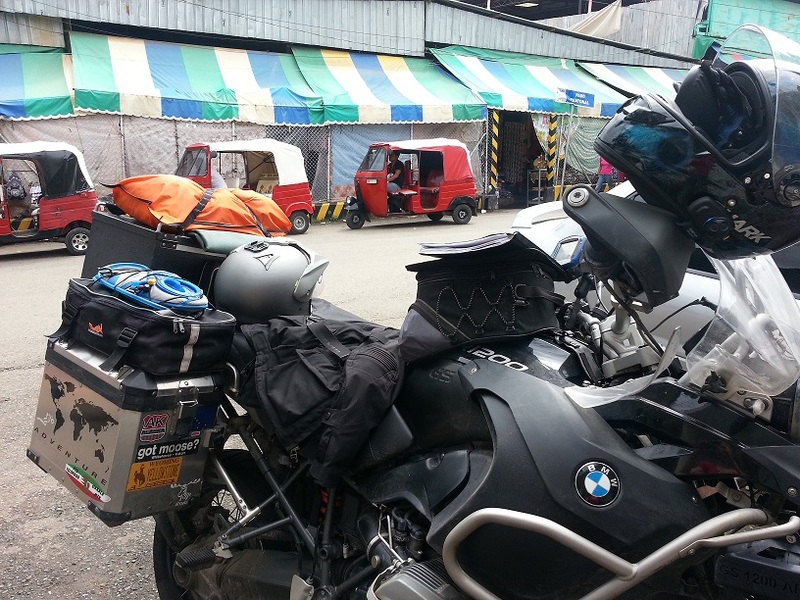 So – it makes for interesting riding; and it requires lots of concentration… especially when you add in the windy nature of many of the roads, the blind corners, and the various people/animals/other objects on the road. To this list, we have recently added pigs, piglets, hens and a skunk. You get the Noah’s Ark of animals on the road here in Mexico, that’s for sure! Today was also heavy on the army checkpoints. We did get stopped at one, but after asking where we’d come from and where we were going, the soldier waved us on. We made pretty good time – by Mexican road travel standards – including risking taking a toll road in the morning without knowing how much it cost, and only having $100 pesos left. We thought it’d be enough… then again, we did have a $200 peso toll day a couple of days ago! Happily, the toll (and all tolls in Mexico are half price for motorbikes, yay) was only $25 pesos… and the petrol station we needed and found before reaching a major town with an ATM took credit cards. Lady Luck was with us today! Adrian has found us a lovely hotel here, where we’ll be staying for two nights. He’s turned into Master Negotiator (you’d think he negotiated contracts for a living or something?!) and has been getting us deals all over the place. It’s low season here, so the hotels are pretty empty and are therefore keen for our business. 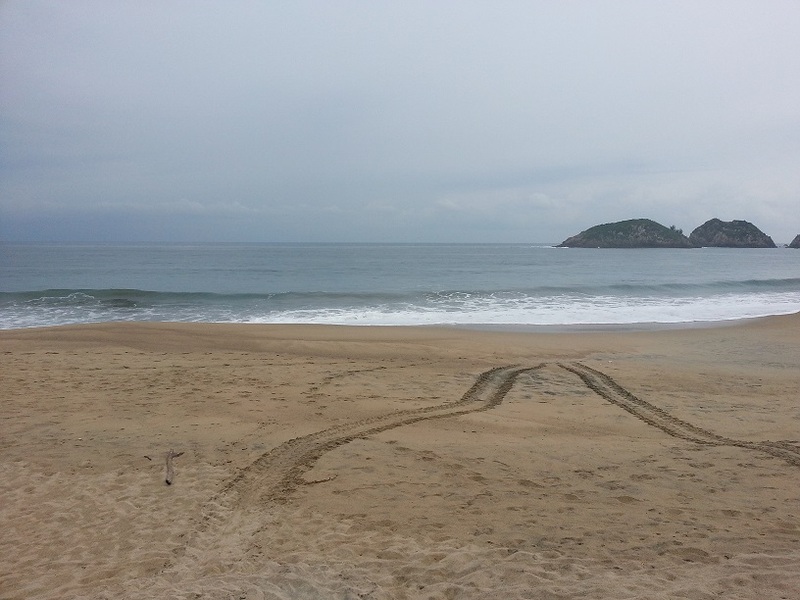 Like here in Zihuatanejo, we’ve got an ocean view and private balcony, with breakfast included – and it costs only slightly more than the campsite we stayed at just outside of Yellowstone National Park in the US. And they have secure bike parking! 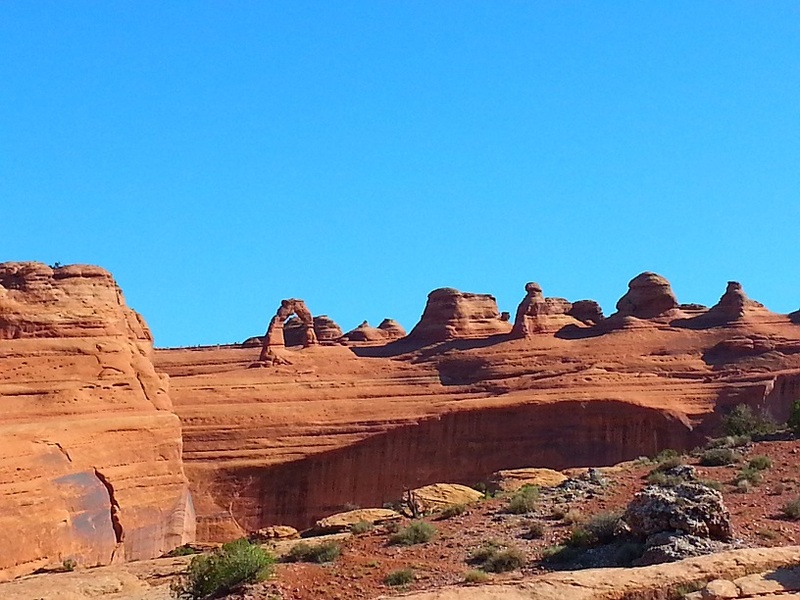 We started the day with an early morning ride back into Arches National Park to see the delicate arch. It was in a part of the park we’d missed over the past couple of days; and we’d heard great things about it. It was impressive – although I don’t think it was necessarily the most impressive thing in the park. It’s the whole national park that’s just so special, so amazing. If you’re ever in the area, I really recommend a visit. The system in many of the national parks over here seems to be that your entry fee is valid for 7 days, which means you have lots of time to go in and out and explore the park. I wasn’t sure about revisiting gravel roads, but as Adrian said, if Harley riders can do it, well – so can we! I’m glad we did… it was amazing! 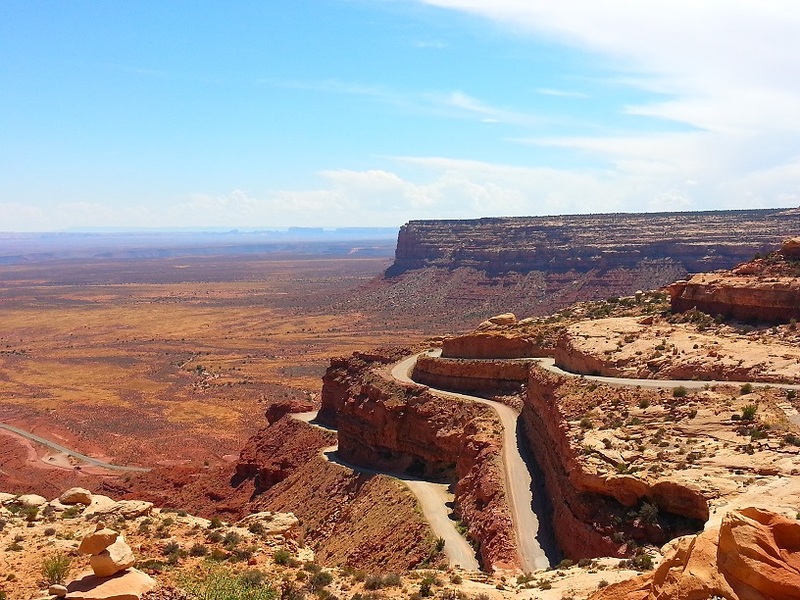 Up there with the Beartooth Highway and several other bendy roads we’ve been on. The pictures don’t do it justice really… the turns were literally on a hairpin, on a cliff edge, next to a 300m drop, with no safety barrier. Now it was my turn for white knuckles – and Adrian couldn’t wipe the smile off his face! 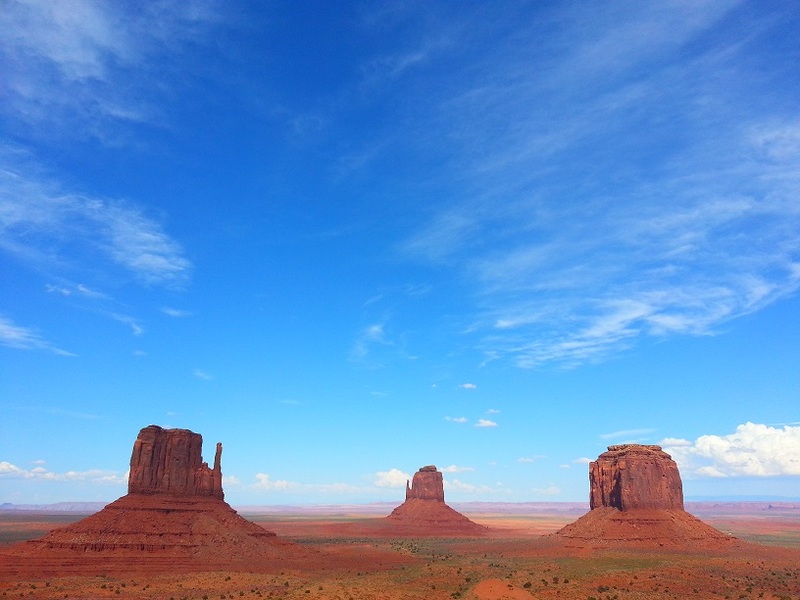 And then we got to Monument Valley. Approaching it as we did, I felt a little bit like someone stumbling across an ancient civilisation. The stones rose up from the earth in a seemingly random yet structured pattern, and looked as if they could or would be home to an ancient people – in caves, temples, cliff homes. 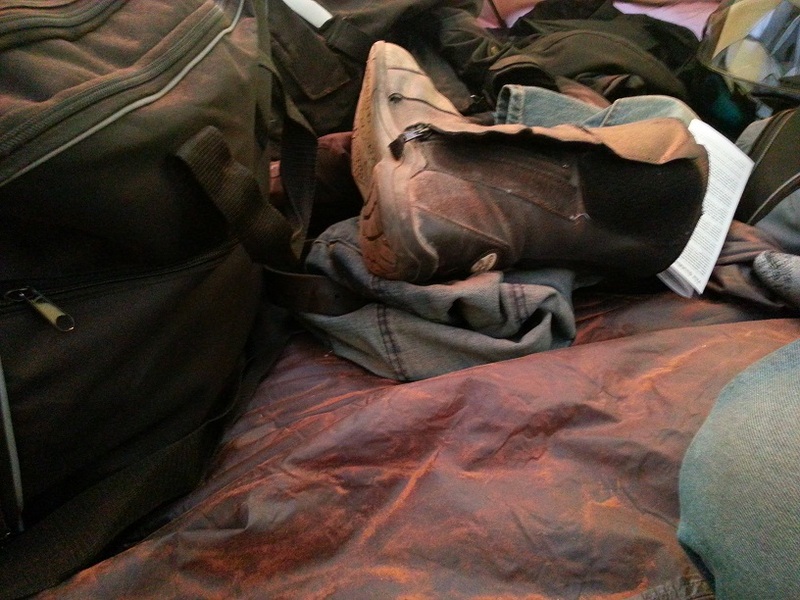 Inside our tent after a desert dust storm! We camped again tonight and it was… interesting. A few days ago, I talked about how I scooped up a handful of Moab desert sand and let it run through my fingers – just to feel it. Tonight, obviously, the desert wanted to get a feel of me.. We experienced our first desert dust storm – wow! We had just finished setting up the tent and I was sitting inside when Adrian called me out to look at the horizon. It was strange – the horizon was starting to blur. It was as if it had been drawn in graphite pencil, and someone had gently smudged it with a rubber. And then the smudge got bigger. And bigger. And closer! All of a sudden, we – and the campers gawking at the impending dust storm around us – realised that we had about 5 seconds before we’d be hit. So everyone hightailed it into their tents to batten down the hatches… to no avail! The wind was filling my ears with sound, as if I had two giant conch shells glued to my ears and all I could hear was the rushing of the sea in the shells. Inside the tent, it was raining red dust. Literally. Although all zippers etc were firmly closed, the dust was so fine that it was just pouring through the mesh of our tent, coating us – and everything inside – in a film of desert sand. A desert storm – it was incredible!